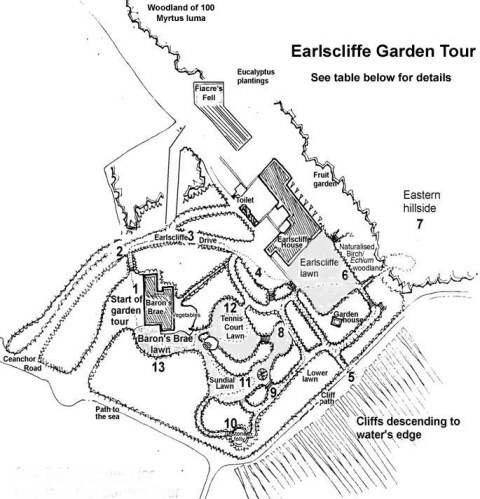 In 1945 Earlscliffe was purchased by William and Norah Martin Murphy. William and his wife moved into Earlscliffe with their son, Chris and daughter, Jane, and very soon had a second daughter, Louise. "I lived from birth (in 1946) to 3 years old at Earlscliffe, being the youngest daughter of William and Norah Martin Murphy. Regrettably, because of such a short time there, I have no recollection of the house and garden, but know that it was an exquisite place, much loved by my mother, who was devastated when my father sold it after only four years and we moved into Dublin! She told me many stories of the house and garden and the wonderful years there when they had a very active social life so she enjoyed showing it off to everyone. My older sister and brother have strong and good memories of this little paradise in our native and much-loved Ireland; we're all overseas for many years now - my sister in England, my brother in Australia and myself in Canada. It is so gratifying to learn that the Robinsons obviously loved the house and property, borne out by it's status today as a well-known haven for such a diversity of plants. Thank you for this super website. I've sent it on to my sister and brother. regards Louise Martin-Murphy Ottawa, Canada"
Chris wrote the following, and he used the Earlscliffe garden tour map as a guide. "Gosh this all brings back some wonderful memories of my years aged 2-6 (arguably the best years I ever had). I have held back for a few days, while I could muster together some of my memories. The Fruit Orchard may have been where the Eucalyptus plantings are now, or near to where the Fruit Garden is now. I remember my Father spraying the Orchard trees with a shaped copper & brass spray pump back-pack, like a giant brandy flask strung from his shoulders. When the pressure dropped, he would pump up the sprayer pressure with his foot, and then get back to spraying. He also had a beehive in front of the Orchard, and I once saw him smoke the hive to get at a honeycomb, which we had later for several teas. On the Eastern Hillside we grazed a red and white Cow (British Shorthorn? ), name forgotten, who may have been milked occasionally. In the Birch Woodland just before it I learned just how nastily Nettles could sting, and why they should not be used as a toilet paper substitute. Round about Fiacre's Fell was a cabbage patch where a gardener killed a rat with a pitchfork, and where a gardener’s assistant gave me my first boxing lesson (by my request). I leaned hard into one of his punches, which removed my two front teeth. (I unusually grew a third pair, according to my Mother, which I still have.) The poor lad, John or Jack (my father called every male ‘servant’ John or Jack) was hauled before my parents for a dressing down and possible dismissal. I remember standing between him and my parents in the Drawing Room and strongly defending his punching 4 year old ‘Master Chris’ by my request. He was retained. Oh, and I later won the Light Heavyweight Boxing Cup at my School (Ampleforth College, Yorks) after having my nose cracked/broken to the left, then to the right, in the two prior years. I still have the pewter cup (and the headache!). In the Stables area (the quadrangle where the word ‘toilet’ appears) I twice found used shotgun cartridges following my father’s practice with his two silver engraved Purdey 12 bore shotguns (worth a fortune today). Wisely, I was never allowed to use them, let alone load them. On the corner of that quadrangle was a Dovecote with White Doves (which I think were long gone by the time we left). On the ‘D’ of Earlscliffe 3 Drive is where my Mother (who never passed a driving test for the rest of her life) was at the wheel of the family Riley with all of us in the car for a family outing, and my father bullying her into keeping the car on the driveway, when she lost her nerve and stacked the car into the hedge on the left hand side. We all got out of the car, which was towed and repaired, which I always thought was a bit overdramatic and punishing, since we were going really slowly when we hit the hedge. The tennis court lawn or the Baron’s Brae lawn or the Sundial lawn hosted my Father’s multi awarded (twice) Gladioli, and thick Rhododendron (?) bushes. I used to spend many hours on the Lower Lawn observing nature, playing with grasshoppers and watching ants, sometimes in the company of our Bloodhound Sampson. One day I couldn’t find him anywhere, and went back to the house, when a search was commenced. Apparently he was found unharmed on a cliff ledge 2 days later and was winched up to safety. By the number 6 we had a Rabbit hutch, with one White one and one Black and White one, both of which were there one day and gone the next, or so it seemed. I think we had some Chickens in there at one time too. And I can remember one White Chicken and two Rhode Island Reds, and watching one being dumped in a steel bucket of water for brooding on its eggs, and thinking that was pretty cruel. My father had an Aviary erected on Earlscliffe Lawn for a while, but I never remember it having any birds in it. I do remember one of the handymen falling from a ladder when looking into the front right upper bathroom/toilet (looking at the house down the lawn) and telling my parents that one of the female servants had pushed him (true) and not being believed. He survived OK, but his dignity may not have. I also remember a flood in from Earlscliffe Lawn into my nursery at the front (was it down a few steps?) and wading in the mud in the room. I also remember kicking a soccer ball at Nuns (from my Mother’s and Sisters Farnborough Hill Convent School, Hants, UK) in the slate corridors, where also I first discovered that touching the two wires in an exposed light switch without wearing shoes can be quite shocking. And I remember our ENT Surgeon and good family friend Dr Rowan Woods (who later bought Earlscliffe) removing a crayon or coloured pencil lead which had lodged in my right inner ear after some nursery mishap, late at night in his rooms in Dublin. I also remember Dr Woods giving me a sinus/antrim draining procedure, but we don’t need to go there! And I remember very briefly waking up on the operating table (or hospital cart, I am not sure) when he removed my tonsils (I was aged 4, I believe), and asking why I was on an ironing table! My Mother told me often that she was devastated when she had to leave her ‘Beloved, beautiful Earlscliffe’. I think I must have felt the same way too, and seeing all of this brings some of that back. Ah well, such is life! All the best, Chris MM"
"How lovely to hear back from you and I thank you for your response. I'd sent it and my comments along to my sister Jane Broxham in England and brother Christopher Martin-Murphy in Australia and I see that today he has written back to you with his memories and some family blurb to fill in some gaps. I had hoped and was glad that he would respond to you with some background on our family and our time there at Earlscliffe. As he mentioned, our father William was the grandson of William Martin Murphy, founder of Independent Newspapers, who was also the Chairman of the Dublin Tram and Railway Company and also one-time owner of Clery's on O'Connell Street. There's ample historical references to our great-grandfather in various Irish archives. As to Earlscliffe, I think the general consensus is that our mother loved it so much, I'm not sure she ever forgave our father for selling it to move into Palmerston Road, where I spent my formative, happiest years. Yes, Dr. Bobby Woods was a very dear family friend and it was nice that he and his wife had some time at Earlscliffe post-the MMs! In addition to the menagerie mentioned by my brother Christopher, I know that not only did we have Ireland's then only bloodhound Sampson (Sammie), whom the Dublin police 'borrowed' once to track down and chase an escaped prisoner in the Dublin mountains - he found his man, yet one can only imagine the terror of the poor feller being chased by a baying hound! - but we also had a couple of bull terriers (Daisy-Belle and Rodney) who had a litter of puppies at the house and a beautiful golden retriever (Bailey). I'm told that the bloodhound Sampson used to wrap himself around me as I sat on the floor as a baby to protect me from my bullying brother!! I am so glad that you and your wife cherish and continue to maintain the house and grounds; I think our (deceased) mother would be thrilled to bits to know this and suspect she at one time imagined her own children getting married on the lawn, as you did to Karen Robinson. With very best wishes and continued success in your horticultural endeavours and love of Earlscliffe. "My Father passed away in 1981 aged 66, my Mother in 2001 aged 84. William Martin Murphy died in 1919. My Father was born in 1915. So he may have met his Grandfather, but was unlikely to have a clear memory of him. WMM succumbed in 1919 to poison Mussels taken from a rock off Sneem Pier (the shells of those Mussels or their descendants are still on that rock, from which I caught a small Conger Eel at age 7, on the only Father/Son trip I ever had, which I still remember every day of). My Grandfather Christopher died of Throat Cancer at age 48 just before I was born, I think in 1942, which is when our family moved to Earlscliffe. My Godmother, Christopher’s Sister Eva Murphy, who lived in WMM’s Dartry House (sold for Euro 32m a couple of years ago), was my patron and idol until she died in the early 60s, also of Throat Cancer. I think Fiacre’s Fell is a hoot of a name and anagram, and just goes to prove the continuing inventiveness of the Irish. Look after yourself, Chris MM"